Ever met someone who knew exactly what they wanted to do for the rest of their life? That’s Marcos starting from junior high school days, where the ambition of financial services began. Marcos, originally from Spain, grew up in Arlington, Texas and graduated from Texas A&M University where he earned his Bachelor's degree in Finance. He is bilingual and has his Series 7, 26, 63, and 66 registrations as well as his Group 1 Insurance license. For multiple decades he has collaborated with Dave Ramsey fans and other clientele; such as Federal Employees, members of Teacher Retirement System (TRS), as well as workforces of some of the largest employers in the DFW area. 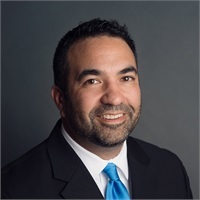 To better serve and bring value to others, Marcos' certification as a Behavioral Financial Advisor (BFA) allows him to create a partnership with his clients in the emotional and factual process of financial planning. He and his wife, Erin, along with their three children reside in Colleyville. They attend Gateway Church and love playing/coaching a variety of sports with their kids. Duke and Joy, from a local boxer rescue group, recently joined they’re playful family. Book an appointment today with Marcos; gain expert knowledge, resources, and a partner for developing your financial plan. Or click here to be recommended a professionally managed risk-appropriate portfolio in a matter of minutes. The Five Star Wealth Manager award, administered by Crescendo Business Services, LLC (dba Five Star Professional), is based on 10 objective criteria. Eligibility criteria – required: 1. Credentialed as a registered investment adviser or a registered investment adviser representative; 2. Actively licensed as a registered investment adviser or as a principal of a registered investment adviser firm for a minimum of 5 years; 3. Favorable regulatory and complaint history review (As defined by Five Star Professional, the wealth manager has not; A. Been subject to a regulatory action that resulted in a license being suspended or revoked, or payment of a fine; B. Had more than a total of three settled or pending complaints filed against them and/or a total of five settled, pending, dismissed or denied complaints with any regulatory authority or Five Star Professional’s consumer complaint process. Unfavorable feedback may have been discovered through a check of complaints registered with a regulatory authority or complaints registered through Five Star Professional’s consumer complaint process; feedback may not be representative of any one client’s experience; C. Individually contributed to a financial settlement of a customer complaint; D. Filed for personal bankruptcy within the past 11 years; E. Been terminated from a financial services firm within the past 11 years; F. Been convicted of a felony); 4. Fulfilled their firm review based on internal standards; 5. Accepting new clients. Evaluation criteria – considered: 6. One-year client retention rate; 7. Five-year client retention rate; 8. Non-institutional discretionary and/or non-discretionary client assets administered; 9. Number of client households served; 10. Education and professional designations. Wealth managers do not pay a fee to be considered or placed on the final list of Five Star Wealth Managers. Award does not evaluate quality of services provided to clients. Once awarded, wealth managers may purchase additional profile ad space or promotional products. The Five Star award is not indicative of the wealth manager’s future performance. Wealth managers may or may not use discretion in their practice and therefore may not manage their client’s assets. The inclusion of a wealth manager on the Five Star Wealth Manager list should not be construed as an endorsement of the wealth manager by Five Star Professional or this publication. Working with a Five Star Wealth Manager or any wealth manager is no guarantee as to future investment success, nor is there any guarantee that the selected wealth managers will be awarded this accomplishment by Five Star Professional in the future. For more information on the Five Star award and the research/selection methodology, go to fivestarprofessional.com. 3,851 Dallas area wealth managers were considered for the award; 336 (9 percent of candidates) were named 2018 Five Star Wealth Managers. 2017: 2,730 considered, 382 winners; 2016: 2471 considered, 678 winners; 2015: 2,862 considered, 684 winners; 2014: 5,080 considered, 621 winners; 2013: 3,834 considered, 698 winners; 2012: 2,688 considered, 654 winners.